Samsung fans are eagerly awaiting the launch of the all-new Samsung Galaxy Note 8 and now they might have the ultimate view of this new flagship. The Note 8 is expected to feature a giant 6.3-inch AMOLED display which will cover the entire front of the phone. Like the Samsung Galaxy S8, the new Note looks set to include a curved edge with the screen bending around the sides of the device. 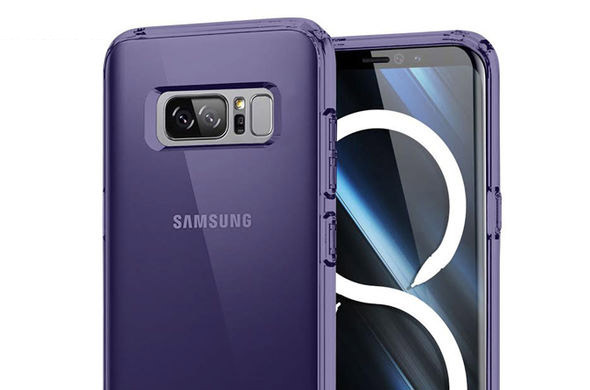 The leaked Caseme case image also shows a dual-lens camera which Samsung is expected to include on the Note 8. Many experts were left baffled when the current S8 flaghip didn’t include this double snapper especially as so many devices, such as the iPhone 8, feature this camera technology. Although there’s good news about the Note 8’s photography there is bad news about the fingerprint scanner. If the image turns out to be real, it appears this vital scanner has, once again, been placed on the rear of the phone right next to the camera lens. Samsung were slated for putting the scanner next to the camera on the Samsung Galaxy S8 Plus as it makes it incredibly easy to cover the camera in mucky fingerprints.